House is a 1977 Japanese supernatural horror film produced and directed by Nobuhiko Obayashi. The film is a sort of horrific fairy tale in which a group of schoolgirls in 1970s Japan travels to the house of one of the girls’ aunt. The aunt turns out to be a witch, and over the course of the movie she and her bewitched house possess and eat the girls. House may sound chilling when described on paper, but the movie itself is more strange than terrifying due to its absurd plot and bizarre visual effects. The devouring of the girls takes place mainly in quick scenes where they are attacked and eaten by household objects; however, one instance is drawn out into a longer sequence in which the aunt makes an elegant meal out of one of the girls. This feast represents a grotesque parody of traditional feasting: certain aspects of the traditional feast are exaggerated in order to create a feasting scene that is both funny and terrifying. Earlier in the movie, one of the girls named Mac leaves the house to retrieve a watermelon from a well and disappears. It hasn’t been revealed yet that the aunt plans to eat the girls, but the sly smile she shows whenever the disappearance is mentioned tips the viewer off about her involvement. Later in the movie, the aunt leaves the girls and sits down to a candlelit dinner in her dining room with the hand of the missing girl prepared on the table. The hand is placed on a plate in the center of the table surrounded by nice dishes and glasses containing colorful liquids. As waltzing dinner music plays, the aunt nibbles on the hand. After finishing dining, she moves happily around the dining room, dancing with a skeleton and watching as her cat walks across the piano. The scene ends with her wearing a pleased expression as she yawns and reminisces. The elements of this scene are normally associated with traditional feasting, but the nature of this feast is grotesque and horrific. The juxtaposition of violence and cannibalism with delicate and refined dining becomes a horrific/comedic parody of traditional feasting. The visuals and sounds of this scene are important for creating the parody. On screen we see exaggerated elegance and comfort. The drinks around the table are colorful and the lighting is gauzy and dim. The hand is shown being eaten, but it is not the focus of the scene; instead, the camera pays attention to the actions of the aunt. The shots linger on the aunt, focusing on her expressions and movements, which are relaxed and content. Sound is used to express some of the grotesque qualities of the scene. The sound of sawing is dubbed in as the aunt cuts into the hand; a loud crunching sound is played in when she takes a bite of the hand; and we can hear her sigh contentedly when the meal is over. Music is both diegetic and extra-diegetic: the same cheesy waltzing melody plays continuously as the scene cuts between shots, yet the aunt dances and hums along at the same time. I would argue that this scene is effective because it plays a psychological trick on viewers that both excites and disturbs them. Certain familiar aspects of feasting are emphasized in this scene: the decadence of the meal, the sense of special occasion, and relaxed manner of dining. If the scene took place exactly the same, only with the aunt eating a normal meal instead of a human hand, we would likely recognize it as a familiar event. These familiar visual cues are twisted by the interjection of cannibalism and violence so that they disturb rather than comfort us. The cannibalism is so cleanly inserted into the scene that it becomes absurd, something we can’t imagine happening in real life. The absurdity of the cannibalism is heightened by the fact that she is somehow going to eat a whole raw hand rather than a cooked meal. This is not the chilling refined cannibalism of Hannibal Lecter, it is something fantastic and silly. The humor of the scene hinges on this absurdity. Without the exaggeration of the decadence of the meal, the scene might appear serious; not something we would feel comfortable enough with to laugh at. I spoke several times in this essay about associations viewers would have towards feasting, but I wonder if these are universal. Is singing, sighing, or reminiscing after a meal a culturally constructed activity? Or could anyone view this scene and understand that it is making references to what a normal dinner would look like? Whether or not these associations are universal, they certainly exist for some, and are mostly unconsciously held. 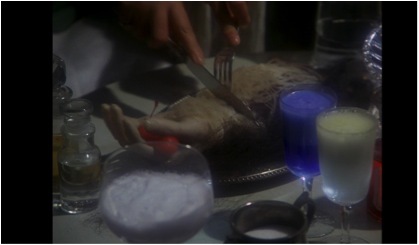 By playing with notions of fine dining and cannibalism, this scene creates an enjoyable mix of absurd humor and horror. House. Dir. Nobuhiko Obayashi. Perf. Kimiko Ikegami, Miki Jinbo, Kumiko Oba, Ai Matubara. Toho, 1977.